Blog - PIPO W9S is in stock and ready to send! PIPO W9S is in stock and ready to send! With the universal of the Windows 10 tablet, people have more knowledge of the Intel processor and the new Windows 10 OS. All manufacturers are building a wide variety of new products relying on Intel and Microsoft platforms, among which Pipo W9S is one of the representative product. 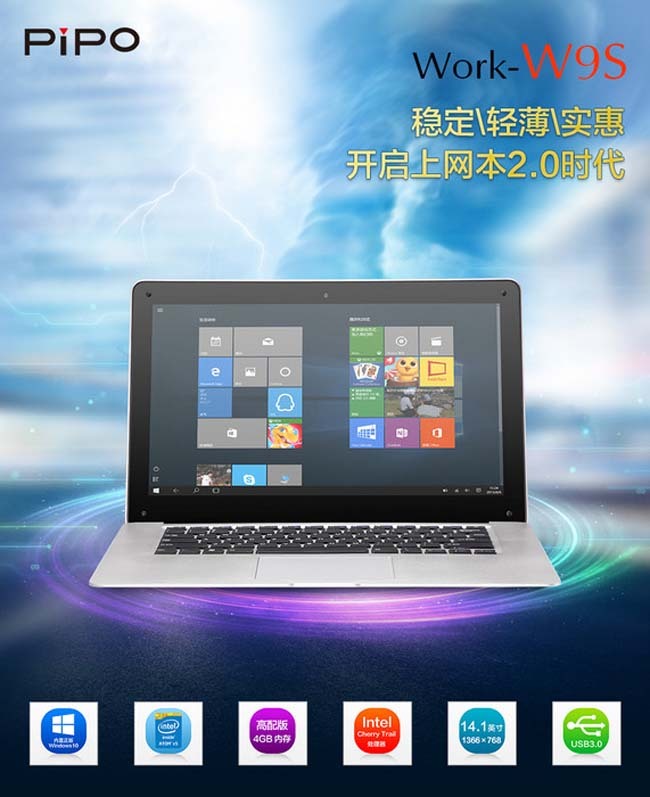 PiPO W9S is a new product which is called as creating the Netbook 2.0 era. Different with the traditional netbooks, W9S adopts the highly integrated circuit design. All parts are soldered on the circuit board intensively by factory, and not removable, which avoids the problem of poor contact, dust for causing conductive, etc. In addition, the chip in the W9S is not only highly-integrated, but also highly-uniformly. For example, W9S adopts Intel-Z8300 processor, which is built in complex arithmetic unit for CPU and GPU. Moreover, the sound card and network card chip of this machine is also unified by intel, which formed a stark contrast with the concept of the various brands pieced together from the old-fashioned netbooks. And now, PIPO W9S has been on sale, and it is in stock and ready to send! PIPO W9S Premium version(4GB RAM) Price: $199.99,PIPO W9S Low version(2GB RAM) Price: $176.99. There is not only a great improvement on the performance and the stability of the W9S tablet, compared with the old netbooks, the process and the design of the new PiPO W9S also has a great progress. It is Ultra-light & thin and chic! What's more, the total weight of this notebook is only 1480g! As for the screen, W9S uses a 14.1 inch 1366×768 screen. 14.1 inch large screen will provide an excellent watching feel for your work, study and entertainment. Though FHD and 2K resolution screen is more often nowadys, 1366×768 pixels is some a little low, but for Windows OS, 1366×768pixels resolution is the best resolution compatible with EXE software. W9S tablet is pre-installed with Windows 10 operating system, which will bring you a comfortable operating experience of the new generation netbook. PIPO W9S Ultrabook is built in a 10000mAh large capacity Lithium Battery. The larger capacity battery combined with the dynamic frequency modulation & pressure regulating technology advanced of the Intel Z8300 CPU, as well as the PiPO's PCB Optimization Design Technology, all bringing an excellent battery life for the W9S, which can continuously work for 4~8 hours for a full charge under normal using, allowing you to keep away from the annoyance of the frequent charging.